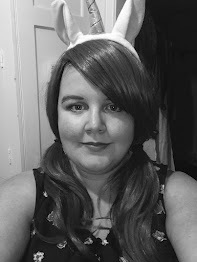 My Problem Areas: One of my longest-running gripes with eyeliners, pretty much right across the board, is that practically every single pencil eye liner that I have ever owned, was too hard and the skin around my eyes, especially on my upper eyelid really did not appreciate it. As a result, I actually stopped using pencils on my upper lid for a very long time, opting for liquid liners instead, and only using pencils (often begrudgingly) on the lower water line. I've also have trouble with them smudging hours after putting them on. I've even had ones that have disappeared entirely. 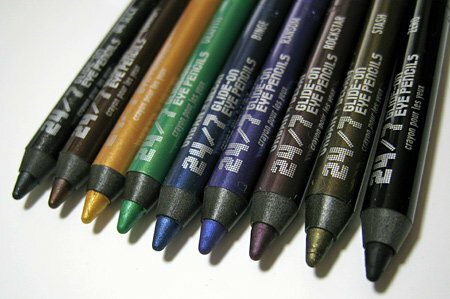 How I found Urban Decay 24/7 Glide-on Eye Pencils: Theoretically, the eye pencils found me! My brother bought me a set containing five pencils, for my 25th birthday. What were my first thoughts? I'll be honest, I was not convinced that I was going to like them at all. This opinion, admittedly came from past experiences with Urban Decay. I couldn't see how these pencils, could be any better than the ones that I had used before, even if these ones had a bigger price tag on them! What about now? I've been using these Eye Pencils for about a year and a half now, and I would never use any other eye pencil. The pencils are incredibly soft, especially compared to other brands which is good for several reasons: First, it means that they're not harsh on my skin, and they apply really smoothly. Secondly, because they're so soft, they blend beautifully, which is extra brilliant, if you are trying for a smoky look. However, the liners "dry"/"set" for want of a better word, incredibly quickly, meaning that smudging and blending should be done pretty quickly, but also means that the liner won't smudge after it has "set". Which colour do I use the most? As you might guess from the fact that I own three (one of which is almost a teeny stub), Zero is definitely the liner that I use the most! It's brilliant for smokey looks, and for using on the lower waterline to complement almost any look. Which colour is my favourite? That's really hard to decide, because they all look incredible. A great thing about these pencils, is the fact that they can be worn with eyeshadows, like typical liners,but also look amazing on their own! Any Downsides? As you might guess: The Price. At £11 EACH, these are definitely not cheap options. However, I will defend that even though they're expensive, I honestly believe that they're worth it, and I have yet to find an eye pencil that is as good as these ones are! If anyone knows of a cheaper one, then I am definitely happy to give it a try!